Morocco’s landscape is awash with ancient architecture; incredible structures which tell stories of this multifaceted country’s past. From fort to fountain, mosque to medina, every corner of Morocco is steeped in bewitching architectural history. Since 1981, UNESCO (the United Nations Educational, Scientific and Cultural Organization) has been awarding sites around Morocco its official seal of approval, naming them World Heritage Sites, and we have chosen our five favorites. Medina: A distinct section of a city, often North African. Typically walled and with labyrinthine streets and alleys. 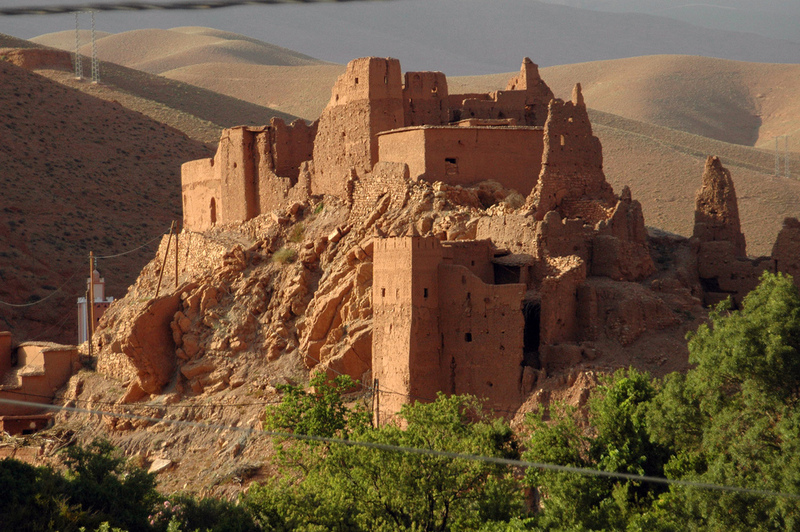 Kasbah: Sometimes used in the same context as ‘medina’. It can also mean a type of Arabic fortress. Souk, or souq: An open-air market, either in North Africa or the Middle East. Souks are divided into specialist quarters e.g. gold souk, spice souk, etc. These are collectively known as a souk. Ksar: North African Arabic term for a castle. Madrasa: Any type of educational institution. The Medina of Fez gained recognition by the UNESCO World Heritage Organization because “[It] is considered as one of the most extensive and best conserved historic towns of the Arab-Muslim world.”¹. Fez, Morocco’s third-largest city, is in fact home to two phenomenal old medinas. Fes el Bali is the larger, and the oldest. It was established as the capital of the Idrisid dynasty between 789 and 808 AD. During the rule of the Marinids, in 1276, a new town, Fez Jedid, was constructed. Both areas gained UNESCO status in 1981. The Medina of Fez is gifted with ornate madrasas, palaces, mosques and fountains, and is also the largest motor-free city anywhere on earth. The University of Al-Karaouine was built inside the Medina of Fez in 859 AD, and is still going strong to this day – as such, it is recognized as the oldest university in the world. Though Meknes was built in the 11th century (it was actually a military settlement at first, created by the Almoravids), it only saw true greatness during the late 17th and 18th centuries. At this point, Sultan Moulay Ismaïl arrived on the scene, and transformed it into the Spanish-Moorish gem it is today. Ismaïl decided he would protect Meknes with a series of steep defensive walls (they stand at an imposing 15-meters-tall), peppered with nine wonderfully ornamental gates. From its dusty, sand-colored exterior, Meknes could almost be a mirage of an age gone by, yet this is a city that becomes even more dazzling once you venture inside the walls. Architectural survivors from days of extravagance gone by include a handful of palaces, a collection of ten hammams, and no less than 25 mosques. If you don’t recognize the Ksar of Ait-Ben-Haddou from tourism promotion, you’ll certainly know it from the various movies and TV shows. This striking community of earthy buildings is located in Ouarzazate province, on the southern slopes of the High Atlas. Although the Ksar of Ait-Ben-Haddou looks like it could date back to biblical times – indeed, it has doubled for the Holy Land in a number of movies – the oldest dwellings here dates back no earlier than the 17th century. What makes Ait-Ben-Haddou so unique is the uniformity of the building material, juxtaposed with the uniqueness of each individual structure. The vivid clay brick from which the city is formed makes it see as though the entire place has been carved into the High Atlas itself; quite a sight to behold. Some of the houses are humble, while others are small palaces. The complex is surrounded by defensive walls, punctuated with a baffle gate and angle towers. Once you have seen the Ksar in the flesh, you’ll never forget it. Marrakesh’s famous medina is without doubt among the most enchanting in the world. The city was founded between 1070 and 1072 by the Almoravids, and became a major hub of commerce, religion and power in North Africa and beyond. As such, Marrakesh’s medina grew to become a vast and impressive walled metropolis of palaces, mosques, schools, markets and more. Much of the ancient city survives today. Among refulgent highlights in the Medina of Marrakesh is the Koutoubia Mosque, the Saâdian Tombs, and Bahia Palace. The architects of the medina also recognized the need for lush green space within the medina, so idyllic retreats such as Gardens of Aguedal, Ménara and the Palm Grove were planted – and still exist now. Marrakesh’s ‘main stage’ is Jamaâ El Fna Square, am intoxicating hubbub of musicians, storytellers, snake charmers, and hucksters. Few UNESCO World Heritage sites anywhere in the world are able to transport visitors into the past so readily. Much of what the Romans constructed in North Africa has long succumbed to the ravages of time. Yet the Archaeological Site of Volubilis offers a fascinating window into how a Roman settlement in Morocco looked and functioned. Volubilis was originally constructed as a Phoenician-Carthaginian settlement in the 3rd century BC, and under the Romans in the 1st and 2nd centuries BC, Volubilis flourished with the addition of walls, basilica, temples and triumphal arch. A healthy olive crop was harvested from the surrounding countryside (close to the city of Meknes), and this is where much of Volubilis’ wealth came from. This afforded residents large town houses with grand mosaic floors, and decadent bronze and marble statues. Such things are still being discovered by archeologists in Volubilis today. In this respect, Volubilis is akin to a mesmerizing open-air museum, with a fresh surprise around every corner. UNESCO deems Volubilis “an exceptionally preserved example of a large Roman colonial town on the fringes of the Empire”, making it a must-see for anyone visiting this part of Morocco. Morocco has four other UNESCO World Heritage sites, which didn’t quite make it into our top five list. Therefore, our runners-up are the picturesque Medina of Essaouira (formerly Mogador), the Medina of Tétouan (formerly known as Titawin), the Portuguese City of Mazagan (El Jadida), and glorious Rabat, which became a UNESCO World Heritage site in its entirety in 2012. Additional to those Moroccan sites already certified by UNESCO, there are many more than currently reside on the ‘Tentative List’. Keep your eyes out for the likes of Oasis de Figuig, Moulay Idriss Zerhoun, Mosquée de Tinmel and El Gour. The full list can be found here.